The happy little whale hottie cover/ P.J case is made to my own original design, and was inspired by my favorite childhood book. It Features blanket stitching details on the back for extra handmade goodness. Retro button eyes, hand stitched mouth and huggable thick body.. Features a flip top tail ( envelope opening on the back) for easy filling/removal of hotwater bottle. A great cuddle buddy to hug on these cold winter nights.Can be used as a pyjama storage case over summer! I have more than one availlable, each one is individually made and pattern placement may vary but each one is equally gorgeous, and I pattern match the checks. please enquire for different colour availability. 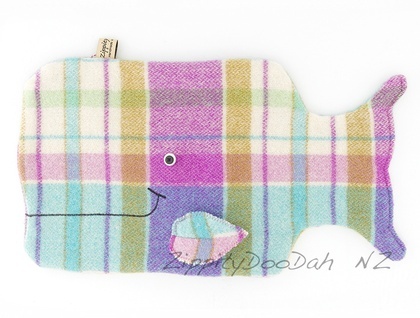 Listing is for one whale cover. Fits standard adult size hot water bottle. Copyright E Berge Zippitydoodah 2010, all rights reserved.